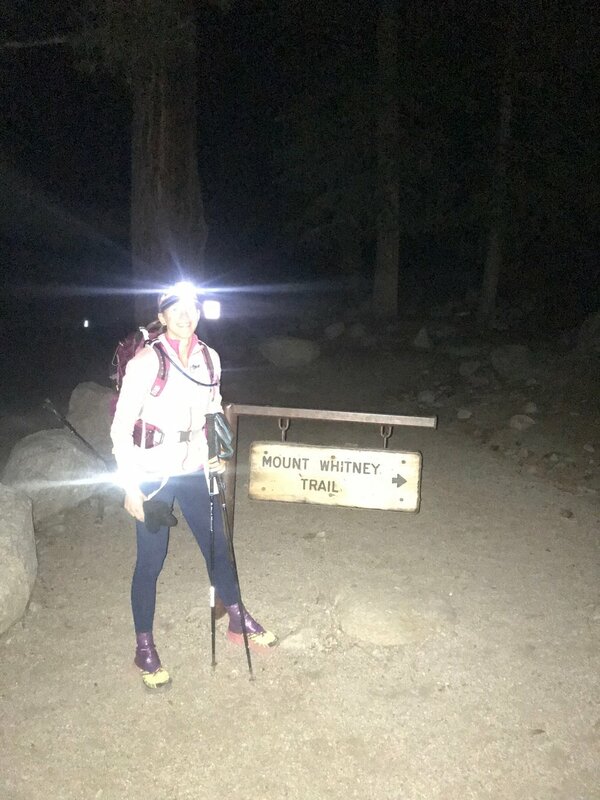 I don’t want to tell my JMT story like I’ve told all my other adventures. This one was different. It feels as if I’ve reached a beautiful alpine meadow after years of climbing the mountain of life, and I have more to say than a stripped down bare recounting of the adventure. If I go back and read through my previous few trip reports a constant theme emerges. A sense of searching and yearning. The universe has been screaming at me, and I’ve been blissfully unaware. I’m failing to hear it through the constant clouding of my life and ego. My near death experience in early May was a rude awakening. It jerked me from my sleep to leave me wondering how long I had been sleeping. But I didn’t slow down and listen to what it was telling me. Only two weeks later the universe grabbed me and stabbed me in the heart… Julias dead. My life came crashing to a halt. I watched around me as everyone’s lives continued living but mine. Mine seemed to have ended with Julia. Let me take a few steps back and paint a clearer picture. In the fall of 2017 my on and off again boyfriend and I ended it for good. I became unintentionally homeless on Thanksgiving when a squirrel destroyed my living quarters. Julia repeatedly took me in during this difficult time in my life. She was family and that’s what family does. Ultimately I escaped my personal hell to Montana for the winter. I started reading Buddhist books and meditating at the local Buddhist temple. I thought I had finally found myself. But by finding who I thought I was I lost my old identity. The thrill and power of winter ultras had escaped my allure. And with this lacking motivation and desire I DNFed both of my races. Next came the Badwater Salton Sea which I gifted my race entry to Julia. My head was no longer in this world. I was loosing my life long identity as a runner. Still homeless when I returned to California in the spring, I took off in my van to pursue a different world of paragliding. The paragliding world took me in and embraced me. I spent close to two months on the road chasing the wind. I fell in with a community of pilots that I traveled around with, and I felt as if I had found another family. Then everything changed. I went to a paragliding clinic where they tow you thousands of feet above a lake and you simulate the possible things that could happen to your wing when you are flying. Conditions were less than ideal, and I only got a few tows. On the last day of the clinic he told me I was going to throw my reserve parachute. He told me to give bad input on a negative spin and the next thing I knew I was spiraling with my risers twisting at violent speeds. I threw reserve without hesitation. Some say it was skill, but I think it was luck that my reserve narrowly missed my violently twisting wing and opened seamlessly. What happened next was also luck… bad luck. The reserve opening tossed me from my comfy seated position in my harness. I was so unprepared that it whiplashed my head so far forward that my head got forced between my twisting risers. The risers twisted a few times above my neck before it stoped twisting. Instead of hanging from my harness I was now hanging from my neck. I couldn’t breath. This was it. I gasped for one more breath forcing my fingers between the risers to try and release pressure on my neck. I yarded and yarded on the risers trying as hard as I could to get my head out. Seconds before impacting the water I was able to pull me head out of the risers. I landed hard into the water, but I was alive. I had never had the pre death thoughts before. The tunnel vision in your eyes as the life is slowly forced out. Your constant fight to keep living. Your not thinking about your loved ones or what you could have done with your life but on what you can do right now to stop death from overcoming you. My last thoughts would have been me thinking about what I could do to keep breathing. I participate in dangerous sports and have felt the pains of losses all around me, but never this close. It happened so quickly and unexpectedly just as I imagine death did. It comes not when you are prepared or ready but when you least expect it. This rude awakening happened on mothers day. I imagined the calls to my mother. The sorrow that would have rippled through my family. It hurts to imagine. Julia came to Tahoe to console me in this weird time in my life. I had just driven straight from the clinic to Tahoe to settle back into apartment living. And she came up the next day. Life was so fragile. Our clocks are ticking and we don’t know when that time is up. The universe I feel knows and it keeps giving us warning signs. I was having a serious problem with mortality. Julia told me that I couldn’t live my life with the fear of death. That you wouldn’t be living. She sat on the couch and watched me untangle my wet wing and then she slept in my bed that night. In the morning we hugged goodbye. She drove back to Winters where she lived for one more week and then passed unexpectedly like death always does. I got to experience my biggest fears. I watched her family experience grieving as I imagined my family would have. And what it did to me is unexplainable. Everyone grieves differently my therapist likes to say. And there isn’t a right way or a wrong way, and you can’t predict why or when it’s going to hit you and to what level of intensity. I guess I have to believe this. But sometimes I think she is just trying to give me excuses for my erratic and painful behaviors. My first night alone in my apartment after she passed a black faceless object visited me. I screamed bloody murder from my bed as it crept closer and closer and I pushed farther and farther back into the corner. It was the second time in my life I had experienced a fully conscious night terror. I flipped the lights on trembling in fear. No one had heard my screams from my cabin alone in the woods. And I had this overwhelming sense that it wanted me. Whatever it was wanted me next. I haven't slept with the lights off since. My friend Jenelle rescued my from my trembling state in my bed that night and my long time on and off again boyfriend came back to take care of me. Everyones lives were continuing on and I wanted so badly to keep living as well, but I couldn’t. Work was asking me to pick up more tasks. So I did. I picked back up my house project to fill any other waking moment of my time. I had to cram every moment of every day with something so that I never had long enough to feel. I wasn’t meditating or reading. Those tasks were too simple. I would surely break down and cry. Running became even more painful for me. It was her sport. It was our connection. Our community. Our people. My identity as a runner was being lost even further. But I also had lost my identity as a paraglider and my identity all together. Months went by of just existing. I’d cry occasionally, but I existed mostly in a brainless state of busyness. That was until I got mono. My case of mono was strange. It manifested it self in sores on only one half of my throat. I had no cold like symptoms, no cough, or mucus, or fever. I had throat pain and fatigue. It was treated for several things. First bacterial then viral till ultimately it was diagnosed as mono. It wiped me out for close to 4 weeks. I missed two races and finally had to feel. I cried like I’ve never cried before. Not the shock cries and pain cries that I did in the beginning. But the cry as if there was no hope for tomorrow. That I was trapped in a place of darkness for eternity. I finally felt a summers worth of pain in 4 weeks. Julia is dead. There is no amount of tasks in the world that will make that statement untrue. No amount of busyness that will make that less painful to say or think. I feel so done. Apathetic. Apathy doesn’t always mean abandon, though; It makes me want more — to fill some newfound emptiness. Maybe it was always here, and I just noticed it, or just noticed what it means. Or theres the proactive approach that this my fault, I am to answer for this; because I care I have created a vacancy that I now feel the need to fill. Either way, I still feel like I’m in something I need to snap out of. Either way, this entire train of thought is probably arbitrary. I think I prefer elevator music as a canvas for my consciousness. This is probably also why my success in life is becoming progressively non existent. My mind is like one of the expensive cars with the stereo systems that adjust the volume to how fast you’re driving. The more I attempt to think the faster my synapses fire, the louder everything gets — and instead of it feeling good, or at least proportional, I can’t even see for all of the static that has no where to go. Getting anything quantifiable accomplished is an after thought that actually accounts for a good portion of the useless drivel I come up with, take in, analyze, and finally forget. This is a problem for everyone who associates with me. I feel as if the universe was trying to tell me this was going to happen. That it was queuing me in over and over and I was ignoring it. I’ve been stagnant these past few months really listening to the universe. It’s speaking to us. We just have to listen. It’s not coincidence that dogs can alert people to things before they happen or that goats can predict natural disasters. They are in tune with the universe. Their senses are not suppressed by ego and social noice. Our lives our loud, busy, and shrouded in social constructs that limit or connection back to earth. People are creating festivals to help people live more authentic lives and get outside but are missing the points. Strip out the social media. Strip out the ego. Touch the earth and listen to it. You don’t need to pay someone to tell you to listen to it. The universe will speak louder and teach you more than any person in a classroom ever can. They say everything happens for a reason. Or as others say we will find reason in everything that happens. I recently tend to think towards the former. The reason is set before it happens. And the universe will change it’s outcome if we listen. So what does this have to do with the JMT? Nothing really other than every experience in our lives substantial or inconsequential is shaping our experiences and how we interact with the world. Julias death is substantial and I feel as if it plays an important part in this story. 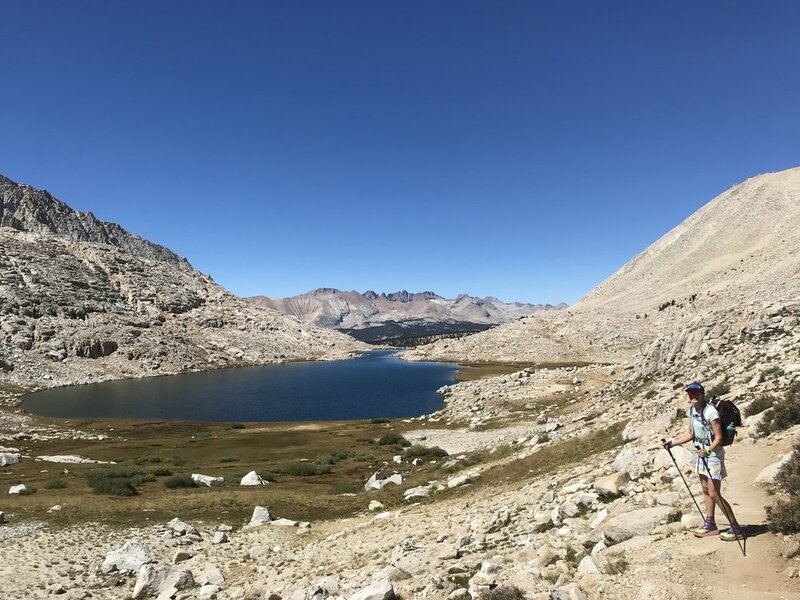 I won permits for the JMT back in March of this year. It was an objective I had been dreaming about doing for years. I teamed up with Stacey and we loosely planned the mission. Julias death and a myriad of other things left us planning the adventure just a few weeks before. For many reasons we decided to not use my permits. It’s difficult to get permits going South to North (mine were North to South) which is the preferred direction with close to 10k less elevation gain. And the bear canister requirement is super heavy almost making it a backpackers trail not a runners trail. We decided we would be “day hikers” just doing 5 long days back to back to back. We secured Whitney permits and set on our plan. I struggled mentally with if this was the right time for this mission. I had been very emotional and sick for most of the month of August leading up to the adventure but was excited and knew I could pull through. As to not bore you with the details everything went to plan. My friends Jenelle and Gretchen came and met us at Kearsarge where we resupplied. I can't thank them enough for their support. The next day, after a cold sleepless few hours of tossing, did not go as smooth. It was brutally hot during the day and my mental state was dwindling rapidly. Poor Stacey sat with me on the side of the trail while I cried the cry of helplessness. Not because of the mission but depression will follow you even into the deepest mountains. We got up and kept moving but the thought of bailing at Bishop Pass was discussed. I caught a second wind and we started to run. Bailing at Bishop Pass was a distant memory as I was riding another wave. A much warmer 2 hours of sleep were welcomed and I woke even more rejuvenated than the day before. Excitement welled inside of me of the prospect of continuing on this journey. 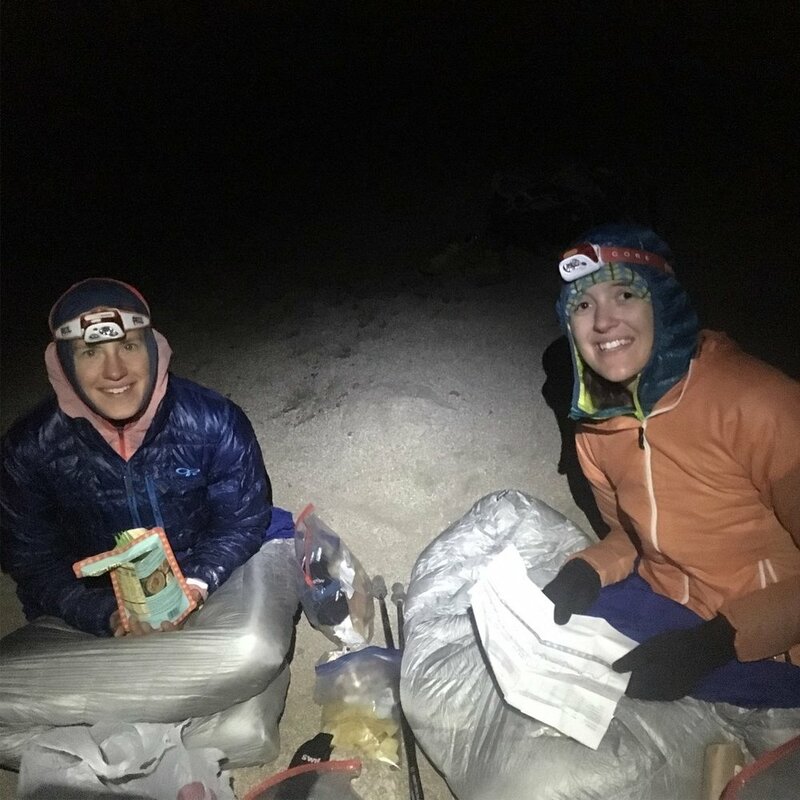 As we arrived at Bishop Pass early in the morning we met with Coralie for our second resupply. Then the perfect storm happened. 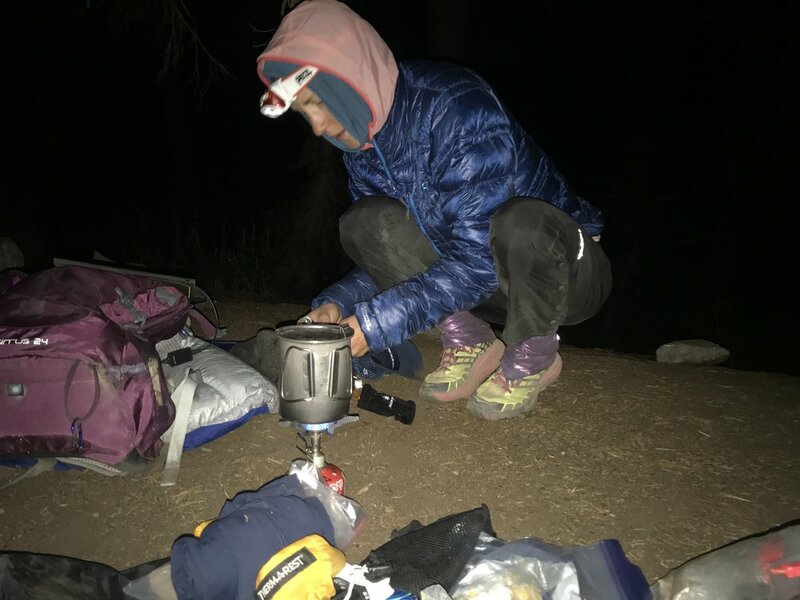 To keep the story short we didn’t have a permit nor a bear canister and though we told the rangers we were day hikers they, for many reasons, knew we were lying. We weren’t given any tickets but were asked to leave the trail in more or less terms. 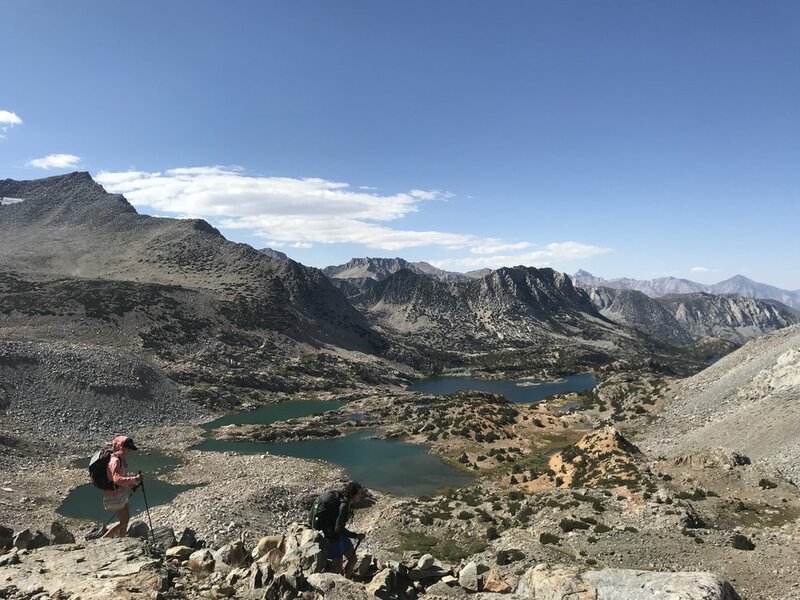 We mulled over the ideas of continuing on and what that would mean but ultimately didn’t feel good about it so left at Bishop Pass with Coralie. 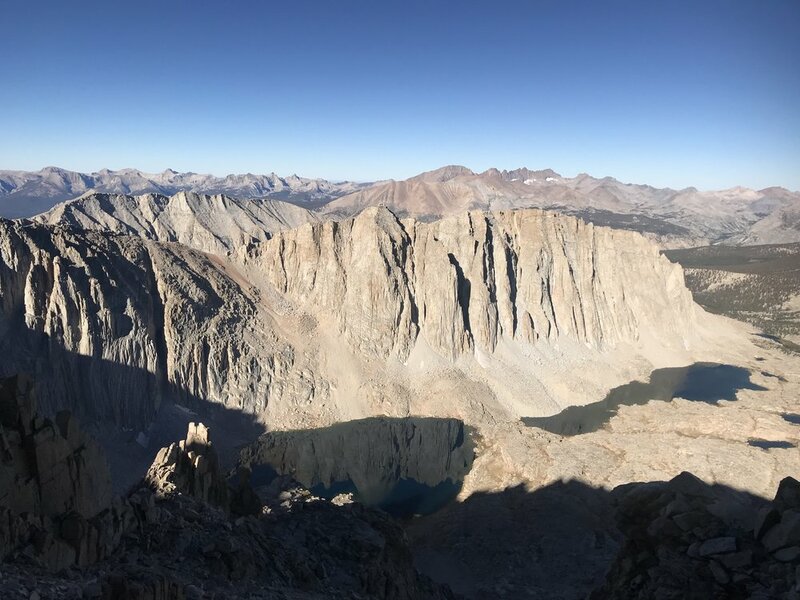 Maybe I make things up in my head or maybe I’m trying to be more in tune with what the universe is speaking to us, but it felt in that moment that leaving Bishop Pass with Coralie was the right decision. My ego and everything else in my body wanted to continue. 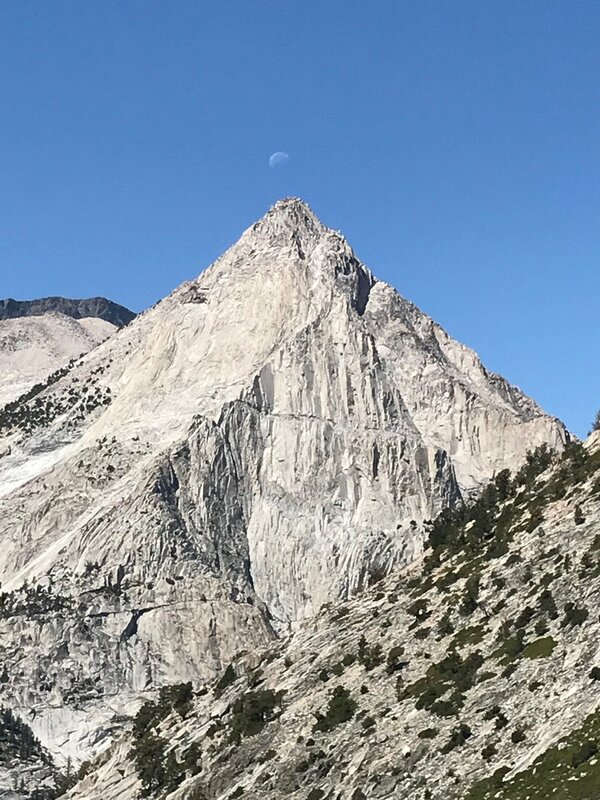 It wanted to finish the JMT. We were capable. But I have to feel that the perfect storm was so perfect for a reason and to ignore that would be crossing the universes wishes. I say this because Coralie’s service dog started to have crazy neck tremors and the thought of leaving her to hike out alone and something worse happening wasn’t even an option. I say this because Corbin had expressed disinterest in crewing us at the VVR and I later found out his truck which had lost a wheel unexpectedly in Mexico a short few weeks earlier was showing signs of the other side going to go out. I can only imagine the consequences of loosing a wheel on the narrow cliff roads out to the VVR and what that might mean. 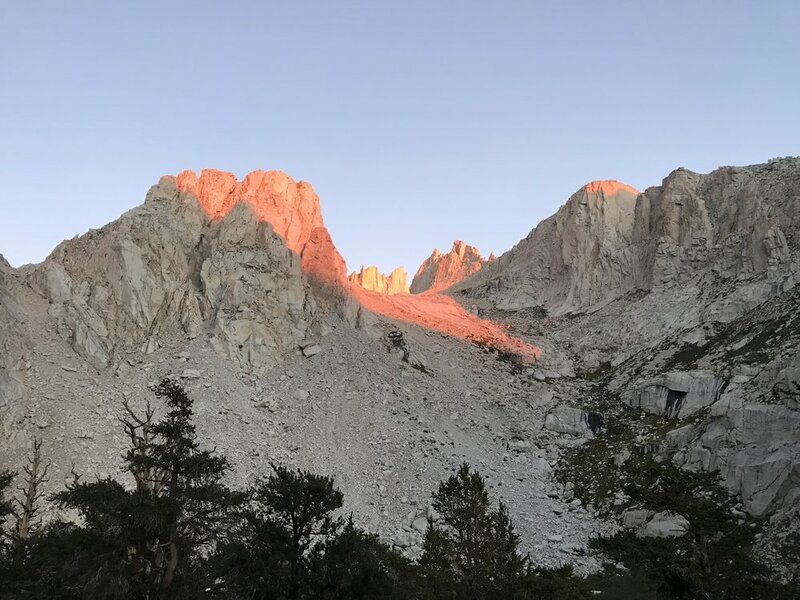 I say this because we planned to hitch hike all the way from Yosemite Valley back to Lone Pine and as safe as that sometimes feels it often times is not. I say this because we hiked out with Coralie, had a delicious dinner of donuts, all rode back to lone pine together, got breakfast in the morning, and everything was okay. I don’t know if everything would have been okay if we continued. And so this journey was beautiful. And it was successful. And I would change nothing about it. So where does this leave me? I don’t know. I feel more lost and alone now than ever before in my life. I am not a runner, or a paraglider, nor am I a climber… I’ve accomplished nothing this year but a long list of failures. But I’m searching harder and listening as intently as I can. I’m getting older. I’m growing up. I’m learning. I’m alive. I want to be everything and nothing all at the same time. As I go back to meditating and letting the emotions of Julia run through me. I will hopefully come out the other side someone that has felt something.